Whose Christmas Coin Is This? Now I am going to tell you that I am an active and well know cacher in my area. I have consulted fellow cachers and no one here seems to know anything about these. In the cache there was no mention of this coin drop almost as if someone doesn't want to know they have them. Is there any one traveling for the holidays that has these coins? I sure would like to get more. I would like to get my hands on a couple of thes as well. That is the best christmas one I have seen so far. How cute, even if they spelled "bushwhack" wrong, lol. I'd love to have one of those. Congrats on your cache find Damenace! Those are very cool! Kudos to whoever made them and wish I could get one! OH MY GOSH HOW CUTE!!! Maybe the guy in the sleigh dropped it off. Look at the smile on his face. It Is not mine but I would love to get acouple of them.. Great looking coin..
That is a great coin Would love to get ahold of some of these. Good find Damenace. Did you check the logs of the cache you found it in? I'd imagine one of the recent visitors left it or possibly the cache owner. I would see who the last one was that found it before you found it because anyone before that usually ends up in a collection. I agree with AtlantaGal my guess is the owner knows as well. OMG - that coin is awesome! If they didn't want their life a living hell, they should have never made a geocoin ! Looks like a new coin is trying to be hyped up here! I'm not hyping it up I just can't remember where I seen it. I saw the backside poem posted in the general forums last year, but I've not see a coin. Perhaps that's where you saw it too? Could be, but I do remember the front also. 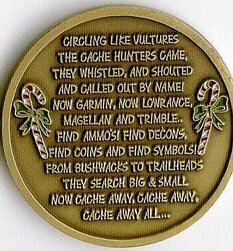 It seems the person who made the coin posted about it and that it could only be found in caches. It was about the same time that Kilted Cacher made his. I think this is a scam. The OP knows very well that he minted the coin. He is just hyping it here in hopes that we're all going to be coveting the coin. Expect to see it on Ebay by the end of the week. Well it is a 2005 coin so it is not that old and I want one bad! Email the cache owner to find out the mystery of the coin. It looks like I asked this question at the wrong time . Believe me there was/is no correlation to any of the the other posts that may have left a bad taste in your mouth. I remember the poem and stuff. It was in one of the forums since October cause that was when I started this coin stuff and haunting the forums. That is a great coin! What state was it found in? Wow, This is scary!! Who put that coin in my cache??? Saw the photos and I thought it was AWESOME. Sure would love to have one of those beauties. Stay tuned for more. Wait a minute - you were out caching?!?!?! Seriously, that's a great coin. Nice gesture by whomever left it. 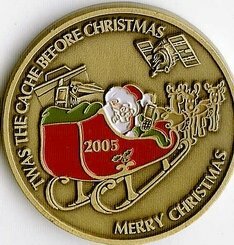 The last thing I could get excited about would be a *third* Christmas 2005 geocoin but good for whoever made it to be dropping it in caches instead of being out to make a buck. Of course, now if they go on sale here tomorrow my head will explode, LOL. And good for Don to actually be out caching too. UNLIKE KEALIA! Hey! I'll be at the event Friday - does that count?!?!? Hey, All you coin and caching folks, I heard from a good source that Santa may offer some of these coins on E-bay. So stay tuned, you may like his offer!! If it has a buy now on it I am in. You have got to be kidding me !! What is up with this?????? GAHHH... Offline for 10 mins and this is what i get! I guess I need to get a tree before I look under it! What's that? A fishy smell? I now have to 1. Change my pants! 2. get more tissues to wipe my eyes 3. hit refresh on ebay to grab the next one 4. be up all night...... must I continue??? Is this coin like the Hawaii coin ? That coin is a product of Kirkland so no, he wants top dollar for his coins. In fact just send your address and forget about any payment!!!! PLEASE CAN I SEND MY ADDRESS SANTA????? This one is being sold for less than cost with by it now and free shipping. Did you hear that thud ! That was me falling out of my chair. Alright time to pick myself up ! I would really like to get 2 of these for my dad and myself. But I can contact any one on ebay with out haveing feedback on myself. hopefully my plead will land on the right ears. I have a four year old and eight year old that have a combined collection.... Santa's not gonna let them down is he?????? I have not gotten an email yet so here is the photo of one child (the other wasn't movin').